It has been a beautiful fall, with plenty of warm sunny days and just enough cool nights to bring out the asters, one of the primary sources of nectar in fall. When we harvest, we try to leave enough honey for the bees to get through the winter (at least two boxes of capped honey per hive), but we also count on the late-blooming sweet clover, asters, and goldenrod to help boost the honey stores after we take off the supers. A couple years ago, the asters didn’t bloom, and one of our hives starved to death before winter even set in, so now we make sure we check in earlier in the fall, while there is still time to feed any hives that are ailing. This year, when we checked on the hives in late September, about four weeks after harvest, the boxes seemed heavy enough, and the asters have been blooming right on schedule. We have noticed lots of honeybees, bumble bees, and little butterflies on our asters in the front yard, but when we drive out in the country to check on our hives, we don’t see much that the bees can work on, which is disturbing. We just hope the bees are able to locate sources of nectar and pollen that we can’t see. We also hope that if there really aren’t enough flowers within foraging distance of our hives that the bees have not been flying around using up energy and eating through their winter stores of honey on these warm days. We decided one day last week to go look in on the hives again, just to make sure things were all right. Sure enough, the hives felt lighter than we had remembered, and there was only a little bit of fresh nectar in the cells. Worse still, one of the hives with a new Carniolan queen, a hive that had been strong during the summer, now appeared to be in decline. There was very little honey left, and on closer inspection, Jim discovered that many of the bees had deformed wings. It is hard to describe the ache I feel when we discover that a hive is sick. I don’t think of myself as a farmer, but when something like this happens to our hives, I can imagine how farmers must feel, after a season of good work gets wiped out overnight in a sudden hailstorm or succumbs to a virus or infestation that ruins an entire crop. The Varroa mite is known to carry a virus that causes deformed wings, so we decided we should order some Apistan strips and treat the hives for mites, even though we did not see any mites on the brood or on the bottom board under the hive. Still, we had not treated for mites this year, so we decided it couldn’t hurt and might help. On Saturday, we headed back to the bee yard, armed with the mite strips, three gallons of sugar water, and division board feeders to insert into the hives. The bees were relatively calm as we inspected their hives.All the drones have been pushed out of the hive by now, and the bees are getting ready for winter. Each hive had quite a bit of pollen and nectar, and all but one hive still have brood. We’ll need to keep an eye on the one to see if they still have a queen. We hope nothing has happened to her and that maybe she just quit laying eggs already. I'm always amazed at how different each hive can be, even in the same bee yard. From left to right: swarm hive, extra lids, split hive, mortgage lifter, sick hive, other split. 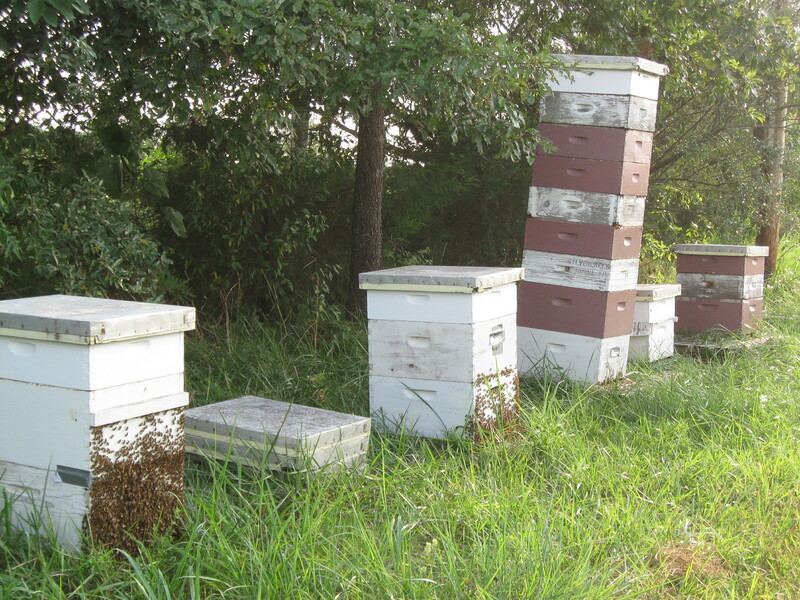 Then in June, at possibly the worst time we could have picked, we had to move our hives to another bee yard, in anticipation of flooding “of historic proportion” along the Mississippi River when the Army Corps of Engineers opened the flood gates upstream. Although our hives were about a mile from the river, they were very near a creek that backs up when the river floods, so we decided not to take a chance on losing the hives. As it turned out, the river ran high all year but not so high as to threaten our hives. After we moved the hives to the new bee yard, we noticed that one of them was sick. For weeks, the hive had been building dozens of queen cells and bringing in little to no honey, but in all that time, they had not managed to raise a healthy queen, and the brood was now shriveled. Jim suspected European foulbrood, which is less deadly than American foulbrood, so we treated the hive with tetracycline, which seemed to help some but not enough. Eventually we decided to order a new queen, but by that time, there were not enough healthy adult bees to take care of the brood, and the hive seemed doomed. We tried feeding the hive to give them a boost, but it was too little too late, and the hive finally died. I felt bad for the beautiful new queen, who never had a chance. This summer made me appreciate even more how different every hive can be, even within a very small bee yard. Early on, Jim dubbed one of our hives the “mortgage lifter.” It started building up early after the winter and the thousands of field bees brought in honey continually throughout the summer, so we had to keep adding boxes to the top for more storage space (and to try to keep them from swarming). As is often the case, this hive was also more aggressive than the others, but it turned out to be the only hive that produced enough honey for us to harvest. The other hives were industrious enough but started out behind, with fewer bees and young or ailing queens. I also found out this summer that I am officially allergic to bee venom. I have since begun to take shots to build up my immunity, because I don’t want to stop keeping bees. I also wear my gloves now and am considering getting a full bee suit (not just the bug-baffler hooded shirt I have been wearing for the past twelve years). I had been stung before without incident, but I had my suspicions, as early as last fall, that I might have a problem, when I was stung by three bees and immediately became dizzy and had to lie down on the gravel drive for a while. There’s nothing like lying on your back watching the clouds float across a brilliant blue sky to remind you how much you want to live—while your husband and dear friends worry over you and call 911. Preparing to move the bees. If the river gets as high as predicted in the coming weeks, it will in all likelihood take out our bees, so we need to move the hives before the field floods. When our friends Hank and Marie let us put the bees on their land (about twelve years ago now), I thought they said that the place where we put the hives was far enough from the creek that it had not flooded in 1993, but they told us Friday at the dance that they weren’t actually at home that summer, so they’re not sure how much of the field was flooded. 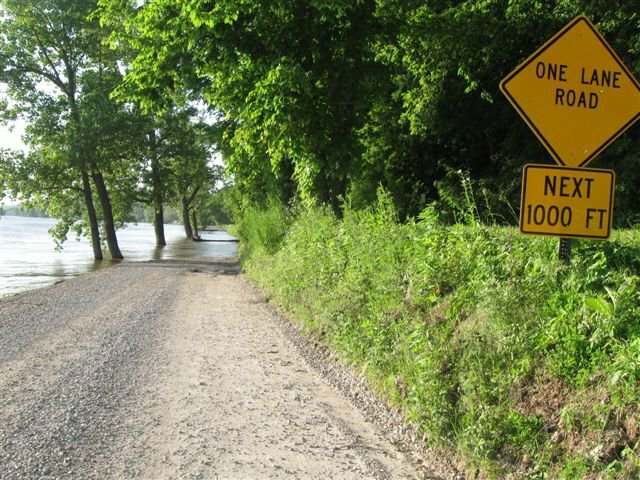 They do know, however, that when the river hits 26 feet in Jefferson City, Hank’s brother, who lives down a gravel road past the bee yard, has to canoe in; they themselves have to park near their upper gate and walk in. That is the stage at which the creek that runs through their property overflows its banks and completely floods the lower field as water from the Missouri River backs up into nearby creeks and spreads out across the bottomlands. During the last major flood, in 1995, their 100-year-old farm house was only about four feet above the floodwaters, and the house is quite a ways up the hill from where the bees are. From what I can tell by poking around various websites for the Army Corps of Engineers, National Oceanic and Atsmospheric Association, news releases from cities upstream, and other sites that post river levels along the Missouri River, it takes approximately eight days for the additional water to reach us from Gavins Point. The current flow rate is about 80,000 cubic feet per second; the flow rate could go as high as 150,000 by mid-June. The resultant flooding is expected to last for six weeks. Even if the flooding turns out to be less dire than predicted and the water doesn’t reach all the way across the field to the bees, the field will most likely be too wet to drive in for a while and the bees won’t have anything nearby for forage. (I wonder what it does to the bees’ sense of navigation when all their usual landmarks are covered in water.) At last reading the river at Boonville was at 23.4 feet (21 is flood stage). Cooper’s Landing cancels all events when the river hits 26 feet in Boonville. It is odd to have flood warnings out when the skies are blue and my garden plants are in need of water. On Thursday after work, we drove a little ways south of town to help friends figure out what was going on with their new bee hives. 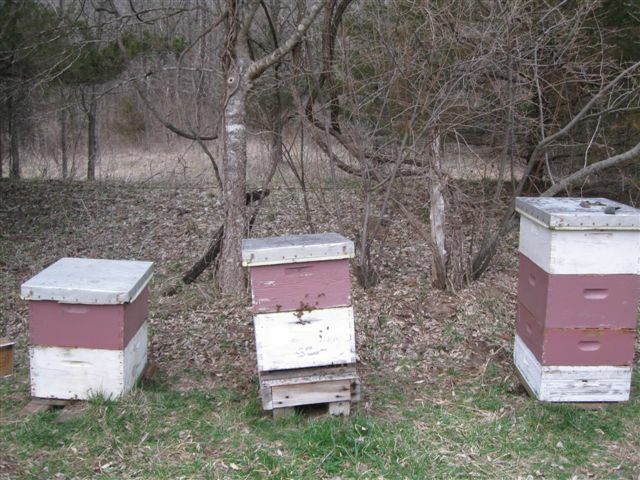 They were fairly sure that one of the hives had lost its queen, so they had ordered a new queen but wanted some advice before leaving town this weekend to perform in a music contest at Silver Dollar City. The dad had first kept bees a couple years ago, and one of the sons had built several bee hives as part of a 4-H project. They had also helped us retrieve a colony out of a bee tree that the city had knocked down during a road construction project several years ago. Since then, however, they had lost all their bees. They decided this year to start over and had ordered four new packages from Art Gelder at Walk-About Acres. I thought about the day we went out to pick up our new queens and saw all those packages of bees. I wondered how many of the packages were going to brand-new bee keepers and how they would know what to do with them when they got them back home. Art told us he had sold over 300 packages this year. 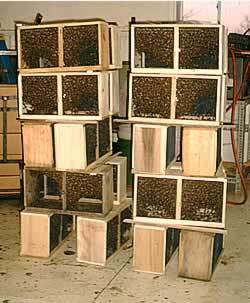 I had never actually seen a “package” of bees myself until this spring and was fascinated to see hundreds of small wooden boxes stacked in the back building, each covered with screen and each containing a pound or so of bees. An assistant was using a large vacuum to clean up the bees that were crawling around on the outsides of the packages. While we were talking to Art, several people came and carried away 1-2 boxes of bees. It was a sunny breezy day, and we were all in good spirits and optimistic about our new packages and queens. By now, it has been three or four weeks since our friends set up their new hives, inserted the new queens (one per hive), and then shook a package of bees into each hive body. (See Honeyflow Farm for a nice photo essay of this process.) Their bee yard looked great, with four freshly painted hives arranged on pallets behind a section of wooden fence that runs between the bee yard and the driveway. The father and his three sons (ages 14, 11, and 9) have each taken on responsibility for one of the hives, and they have named the hives accordingly. John’s hive was the one that seemed to be having problems, so we started with it. Compared to our hives at this time of year, the new hives seemed quite calm, with few bees flying around the yard, even when we had the hives opened. It was interesting to notice how they had set up their hives “by the book,” with components that Jim doesn’t typically use, such as the queen excluder, inner cover, a plastic frame for drone production, and an exterior feeder. It was also interesting to see all their hives at the same stage of development, while ours are all at different stages. Our two split hives and the swarm we caught all have small stacks of boxes (one hive body and one super), while a fourth hive has about three supers on top of two hive bodies, and the remaining hive (the one that made it through the winter in great shape and didn’t swarm this spring) already has filled six supers with honey. While our friend worked to get the smoker going, Jim removed the cover, inner cover, and the empty super and set them aside. Then he took off the queen excluder and we all looked down into the top of the hive body and saw that the bees were building new white comb between the middle three frames. 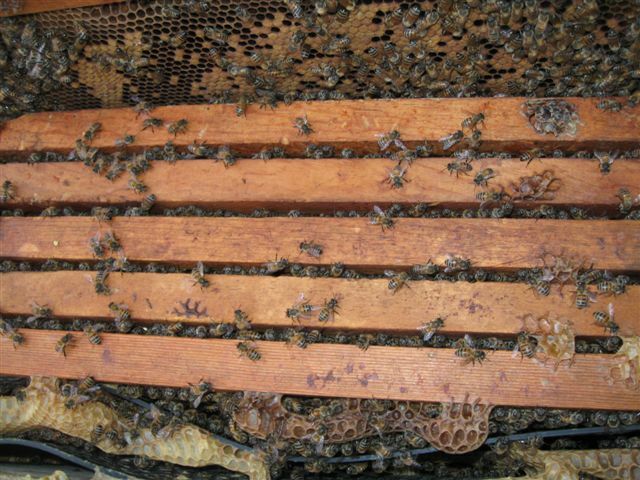 Jim noted that the bees had a little too much space between the frames and are starting to fill in with comb in a way that will make it difficult to work with the hive. 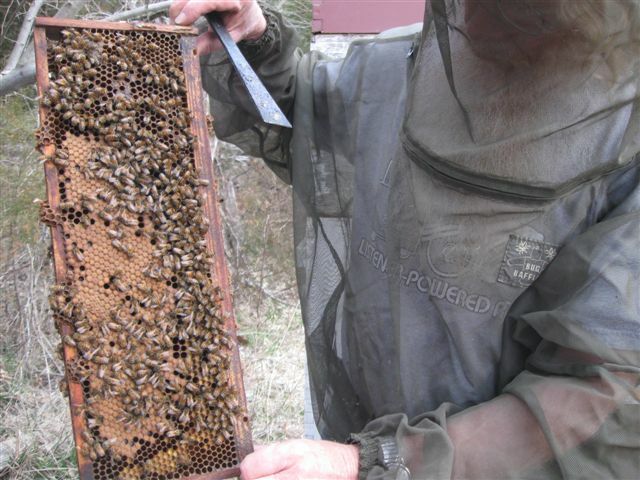 Jim showed John how he usually starts inspecting a hive by prying out the frame closest to the outside edge of the box. At this time of the year, most of the activity will be in the center frames, where the queen will be laying eggs and the workers filling in the surrounding cells with pollen and nectar to feed the emerging brood. Jim removed the first frame, checked it quickly to confirm that nothing was happening there, and leaned the frame against a nearby hive. Having one frame out of the way makes it easier to inspect the other frames. Then he pulled out the next frame, noticed where the bees were starting to draw out the comb, confirmed that there were no eggs or brood in that frame, and put it back in the hive. He proceeded to inspect each frame quickly until he got to the center frames in the hive, where there was more activity. At this point in the spring, we would expect to see brood in all stages of development, with the capped brood toward the center of the frame, surrounded by newer brood and eggs, and cells filled with nectar and pollen toward the edges of the frame. If the queen is healthy and laying eggs well, the bees will generally be calm as they go about their various tasks. Sometimes you can tell if a hive has lost its queen because the workers will be edgy and running around frantically. Although the bees seemed relatively calm, our friends had rightly noticed that there was an abundance of drone brood in this hive and an absence of worker brood, which did not bode well. Often a hive can raise its own queen if something happens to the original queen, but they need strong worker brood to do so. We saw one empty queen cell and one queen cell with brood in the bottom, but Jim was not convinced that it was viable brood and thought it possible that the bees, in desperation, might be trying to raise a queen from drone brood. New queens arrive from the breeders in a small cage with 5-6 attendant bees and a lozenge of hard sugar to sustain them on their travels. We had the new queen ready to insert in the hive, but we needed to do what we could to help the hive accept the queen and not kill her right away. Fortunately, it appeared that the workers had not yet started laying unfertilized eggs, as they sometimes will do. When the workers start to lay, it is almost impossible to get them to accept a new queen. A queen will lay a single egg in the bottom of every cell in a predicatable pattern, but workers may lay several eggs in each cell or may lay eggs on the sides of the cell. Since the workers are unfertilized, all the eggs they lay will turn into drones, which do no work in the hive. Once the workers start laying, the hive is generally doomed. Jim checked all the remaining frames to confirm that there was no queen and no new worker brood; then he cut out the queen cells where the workers were trying to raise their own queens. We discussed the advantages of releasing the new queen to the hive right away versus leaving her in her cage for several days to allow the bees some time to get used to her scent. Jim thought she would be fine in the cage until the family got back from Silver Dollar City early next week, so he left the corks in both ends of the small wooden cage and inserted the queen with her attendant bees and stash of sugar candy between the two center frames, pressing the cage into the wax and then sliding the frames close together. We were pleased to notice a couple bees raise their tails and extend their scent glands in the sign they often use to indicate “this way to the queen.” We hoped that meant they would accept the queen readily and start feeding her through the screen in the next coming days. 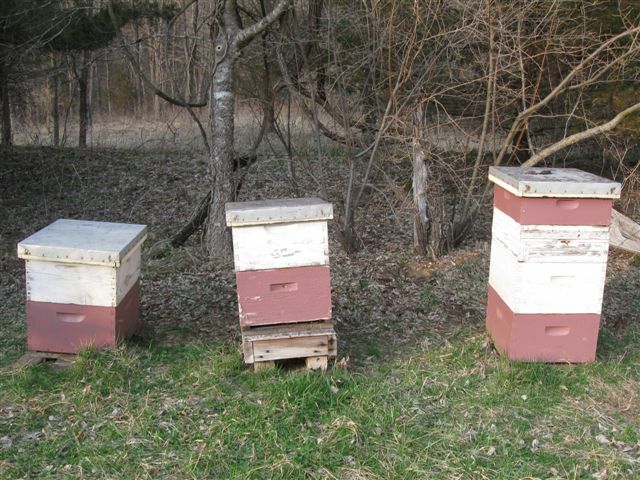 Then we restacked the hive, placed the lid on top, and hoped for the best. It has been another exciting spring in the bee yard. May is swarming time, and beekeepers all around have been talking of swarms they’ve lost and ones they’ve caught. Beekeepers new and old have been eagerly waiting for new queens and package bees to arrive. Art Gelder from WalkAbout Acres had orders for something like 300 packages and I don’t know how many queens. We had ordered two Carniolan queens and were looking forward to their arrival on April 30. Our plan was to split the aggressive hive toward the left of the bee yard and give each box a new queen, meaning we would end up with four hives altogether. The week before the queens were to arrive, on a partly sunny day, we drove down to the bee yard. When we arrived, Jim drove the truck out into the field as usual but made a wider loop along the row of cedar trees, looking up into the branches as he drove. Just before he got to the yard, he stopped and put the truck in reverse, then drove backwards a few feet, stopped, and pointed to a branch about fourteen feet off the ground, where a large swarm of bees was clustered among the cedar needles. We were fortunate to have discovered the swarm before the queen managed to take off for unknown parts with half the worker bees and our hopes of a good harvest this fall, but I could not see how we were going to get the swarm out of the tree. I had helped Jim catch one swarm before, but that particular swarm had settled on a branch lower down in the cedar, so it was a simple matter of taking the loppers and cutting the branch off behind the swarm, then shaking the bees down into an empty hive body. 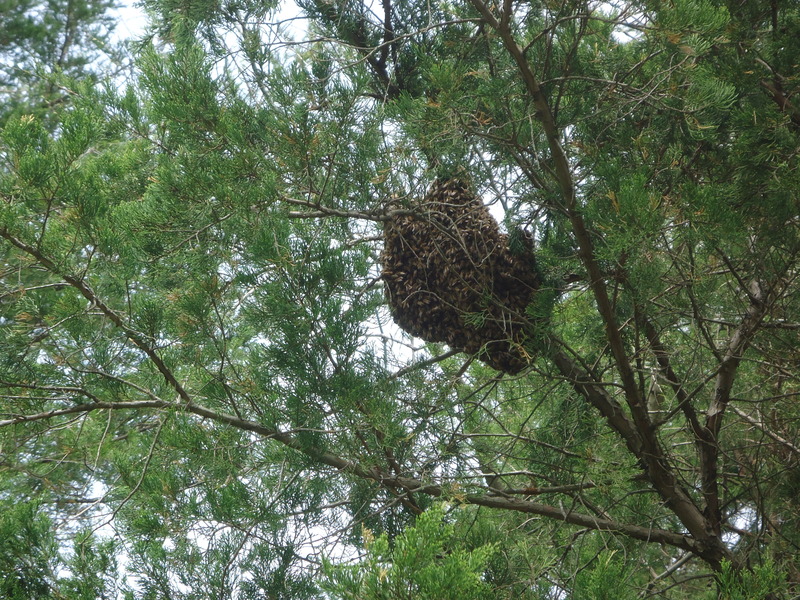 But this new swarm was much higher up in the tree. There was also no way of knowing how long the swarm had been there and whether they might fly en masse to a new location while we were trying to figure out how to catch them. While Jim was forming his plan, he went over to the stack of empty boxes and started moving hive bodies and supers around, checking to see whether he had enough good frames to put together a suitable box for the swarm, noticing in disgust that mice had gotten into some of the boxes and torn up the comb. He found a couple of boards and bricks to use as a base, which we moved closer to the swarm. After we had assembled a new hive (bottom board, screen, hive body, ten frames, top), he said, “Let’s go see if Hank and Marie have a ladder we can borrow and some loppers and maybe a saw. I looked up again at the hive high in the tree and tried to imagine where we would lean a ladder if we had one, among all those prickly branches. Or if we could somehow get a step ladder under there, would any of us be tall enough to reach the branch with the hive? And then what? When we helloed the house, Hank came out in his sock feet and greeted us as warmly as if he had been expecting us all along. He said with a smile that he had been working with his ham radio and thought at first that our knocking was some sort of Morse code communication. Jim told him what we were looking for, and Hank slipped on his boots and led us out back to the tool shed, where he lifted the loppers and a saw off the wall and handed them to Jim. He pointed out an eight-foot step ladder near the porch that we determined was probably not going to be tall enough, then we went on down the path to the machine shed looking for his extension ladder. When he didn’t find it in any of the usual locations, he called Marie on her cell phone to see if she knew where the ladder was, and she reminded him that his son had borrowed it to paint his house. So Hank called his son, who was on his way to St. Louis, to ask him where the ladder was and let him know that we needed to borrow the ladder back to catch a swarm of bees. Soon after, Marie returned from a friend’s house with bags of fresh produce that she began dividing up to share with us. Hank and Jim got in the truck and headed off along a gravel road to retrieve the extension ladder from the other house, while Marie and I walked across the field along the creek to the bee hives and talked about how we were going to get the hive out of the tree. It was a gorgeous day, in the upper sixties, with periods of sun and shade, and it felt great to be with friends on such a lovely spring day, figuring out together what to do next, tossing out ideas, inventing tools and procedures, in great confidence that we would ultimately come up with a workable solution. When we all met back at the cedar tree, we decided the first step was to cut back the smaller outside branches so we could get the ladder under the large branch where the swarm was still clustered tightly together, while a few scout bees searched the nearby woods for a suitable home for the hive. As we were lopping and sawing off branches and dragging them off down the fence row, someone suggested that we could use some kind of forked stick to hold up the branch with the swarm while someone else used a chain saw to make a partial cut near the trunk, and maybe we could use the forked stick as a support to control the branch as the weight brought it down to the ground. Marie went back up to the house to get the chain saw, and by the time she got back, Jim had fashioned a sturdy forked stick out of a branch from the tree. We decided the step ladder would be tall enough after all, so Hank moved it over near the trunk, then climbed up with his chain saw, while Jim and Marie positioned the forked stick under the branch between the swarm and the trunk. Marie preferred that I stay back from the swarm and let them handle the saws and forked sticks and all, since I had just last summer had an allergic reaction to a couple bee stings at their place, which brought out the first responders from Ashland and the ambulance from Columbia. Although swarms are typically not aggressive, I was still somewhat nervous around bees since my reaction, so I sat in my “bug baffler” on the tailgate of the truck and watched as Jim and Marie braced the forked stick against the branch and Hank started the chainsaw and queried, “Ready?” Then apparently, Hank’s new chainsaw cut more quickly than his old one, the branch began falling much more quickly than we had expected, the branch began to sway, Jim and Marie had trouble holding the stick steady, and suddenly half the swarm fell down in a clump on their heads. By then, thousands of bees were flying everywhere. Jim told Marie he could handle the branch and that she should get away from the bees, so she began walking calmly but quickly across the field toward the creek. Since I had my bee veil on, I took Marie’s place and helped Jim guide the branch with the remaining bees down to the ground, not as slowly as we had originally imagined, but slowly enough. After the branch was most of the way down, I moved the bee box closer, and Jim shook the rest of the bees into the box. Then we all stood and watched in amazement for a good while as thousands of bees began pouring into the box. Later, I asked Hank and Marie what they had been planning to do before we showed up and got them involved in catching this swarm, and they said, “This, of course. This is absolutely what we were meant to do today. It’s almost impossible to pay close attention to anything these days and not succumb to Monkey Mind and go leaping wildly from one “shiny” to the next. Thinking deeply about anything has become a luxury we mistakenly think we can’t afford. Although I deliberately try not to “multitask,” and I do what I can to guard against overstimulation whenever possible, still I notice myself losing focus far more often than I’d like, skimming the surface of thoughts, skipping from one thing to the next, and generally trying to do way too much at once. Even when I mean to pay close attention to something or someone, more often than not, I let myself get distracted by my own thoughts, catch myself humming little tunes inside my head, start free associating on something I just saw or heard, or simply forget over and over that I really can’t do two things at once (for example, talk on the phone and simultaneously check my email) if I am to give my full attention to either one. Last night I felt particularly jumpy after a distracting sort of day at work and more than a week of not hearing from my son who is deployed to Afghanistan with an infantry unit. Although I had a long list of things I wanted to do during the evening, I decided that first I should take twenty minutes to just lie on my back on the floor and try to focus only on my breath. I expected it would be somewhat difficult, but I was not prepared for the amount of effort it took to keep still and just breathe. I kept thinking of things I wanted to do, things I meant to do, things I forgot to do, things I needed to write down; I thought about people I hadn’t heard from and wanted to call; I kept trying to remember what was coming up on the calendar, and I had to stop myself several times from jumping up to go see. I felt myself get irritated at sounds out in the street (loud engines, children arguing, dogs barking, basketballs bouncing). How can I possibly be “mindful” with all that racket going on, I thought. And even though we have a clock that chimes on the quarter hour, meaning I would be able to tell with my eyes closed when my self-allotted time was up, I kept opening my eyes every few minutes to see what time it was and then playing with the numbers in my head (counting up and down, subtracting, comparing). I continually had to bring myself back to my breath to try to quiet my mind. Eventually, I got close to a place of stillness, but when the clock started striking six, I didn’t even wait for it to finish before I got up. I obviously need much more practice in mindfulness. I think that is what I love most about working with the bees. There is nothing like a hive of 70,000 bees or so to make you pay attention and focus on what you are doing. On Thursday as soon as we got home from work, we changed clothes, put the smoker and the hive tool in the truck, and then headed toward the river to our friends’ farm to check on the bees. It was about 70 degrees, overcast, and breezy. I was happy to be going back to the beeyard and anxious to see how they had fared over the winter. It felt good to be driving the familiar winding roads again, looking forward to visiting the bees after months of cold and snowy weather. As soon as we drove across the field and got close to the hives, we could see that bees were flying in and out of all three hives, which made me very happy. It felt right to be going through the rituals again on such a pleasant spring evening. Jim gathered the fuel for the smoker, lit the fire, then pumped the bellows until smoke rolled out of the spout, while I fastened straps around my ankles to keep bees from flying up my pants legs and got the bee veils out of the truck. Then I looked around the field and jotted down some notes—peering up at the trees and out across the field to see what is coming into bloom, wondering what sources of nectar and pollen the bees are able to find. I heard spring peepers along the creek and saw a hawk soaring high above the trees. I watched the bees flying in and out of the hives. When the smoker was going good, we put on our veils and walked over to the hives. Because this was the first time we had been able to open up the hives since last fall, we looked through every box and noted the presence of pollen, honey, nectar, and brood. We were delighted to see plenty of capped brood and pollen, plus lots of baby bees, including some new ones just emerging from the cells. The honey stores are running a little light, however, so the adult bees are going to need some help until more nectar starts flowing a little later in the spring. We made plans to come back over the weekend with sugar syrup to fill the feeders. Starting with the hive on the right (the farthest from the one we dubbed “the wild hive” last summer), use the hive tool to pry off the cover. Notice that it is stuck tight with propolis that the bees have used to seal cracks during the winter. Set the cover upside down near the hive. Blow puffs of smoke across the top of the hive and listen as the bees buzz loudly and briefly in unison before they descend into the hive. Use the hive tool to scrape some of the propolis off the top edges of the box; then (using the same extremely handy hive tool) loosen the first frame until you can ease it out of the hive and hold it up for inspection. With luck, you’ll find a picture-perfect frame with the center cells filled with beautiful capped brood, surrounded by stores of bright yellow pollen and nectar. 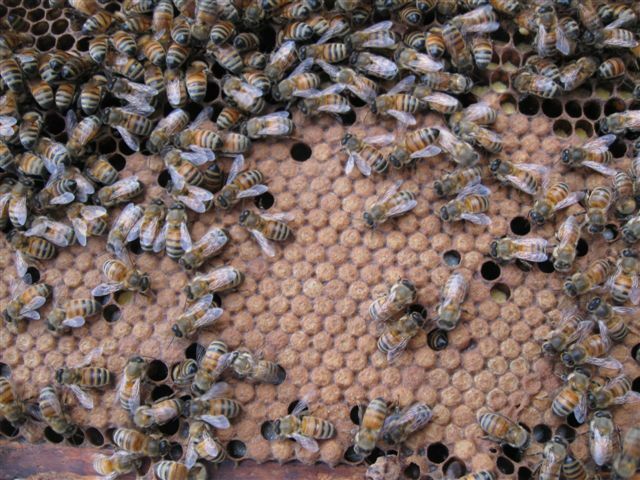 If you have started with a frame near the outside edge of the box, it is not unusual for the cells to be empty of brood, because the queen usually works from the middle of the box toward the outside. After inspecting the frame carefully to verify that the queen is not on that frame, lean it against the outside of the hive; that way you’ll have an easier time getting the other frames out to inspect. Pry the next frame out and repeat the process, except this time, put the frame back inside the hive rather than lean it against the outside of the box. After looking at every frame in the top box, put the first frame back in, then lift the entire box and set it aside on top of the upside-down cover, so you can go through the next box down. Repeat steps until you have looked at all ten frames in all the boxes of the hive. 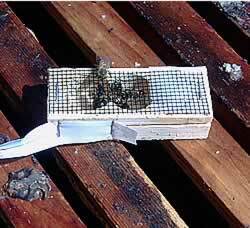 When you get to the bottom board and screen, use the hive tool to scrape off any debris, shake out the screen, stamp down the earth beneath the hive if it appears that mice have been burrowing underneath, and rearrange the supporting bricks or boards, as needed. Replace the bottom board and screen. Think about whether you need to rearrange the boxes or replace any frames). By this time, with the hive disassembled and the bees disoriented, there will be bees flying all about. The first time I stood in a beeyard filled with flying bees, I felt dizzy with all the motion and the buzzing going on around me and completely vulnerable with only a mesh cloth between me and “sudden death.” At that time, all the buzzing sounded the same, but I have learned to identify different sounds and can usually tell by their sound when the bees are happy and when they’re not. No matter how happy they might be when you first approach the hive, by the time you have messed with them and their hive is in disarray, some of the bees will undoubtedly have started investigating you more closely and may changed the tone of their buzzing to a louder, more aggressive warning kind of buzz, not the contented humming sort of buzz when they are working the flowers or the alarmed buzz when you smoke the hive. You might notice a couple bees coming up close to your face and hovering nearby peering into your veil, as though they were trying to look you in the eye and get your attention. Some guard bees will physically bump up against you to try to tell you to back off. The important thing is to remain calm, not flail around or swat at the bees, as you put the hive back together. Sometimes a little smoke helps as you re-stack the boxes. Place the cover back on top. Repeat the whole process with the remaining hives. What we discovered with each hive was that the boxes lower down were basically empty, with no brood and no honey, so when we restacked the hives, we reversed the boxes, putting the empty ones up top. As I understand it, when the queen is laying eggs, she naturally moves up in the hive in her search for empty cells in which to deposit her eggs, so if we put the boxes of brood (where the queen is most likely to be) on the bottom and the empty boxes on top, the queen will be encouraged to move up into those empties as she continues laying eggs. Also, the feeders were originally in the bottom boxes, so having them toward the top will make it easier when we take sugar water down to the bees this weekend. (The feeders we use are plastic trays that fit in the space of a frame and can hold about three quarts of sugar water each). We also discovered in one of the hives that three frames had big holes in the foundation (old damage from wax moths or mice from some earlier season), which would not bother the bees at all but would make it more difficult on us later, after the bees get going and fill in all the empty space with new comb. The same hive has already “made a mess” of comb around the feeder, which had warped and left spaces bigger than the traditional “bee space” that bees seem to like between each layer of comb. So they filled in the gaps with layers of creamy white comb that follows the natural shape of the warped plastic rather than the engineered straight lines of the frames, which beekeepers prefer. 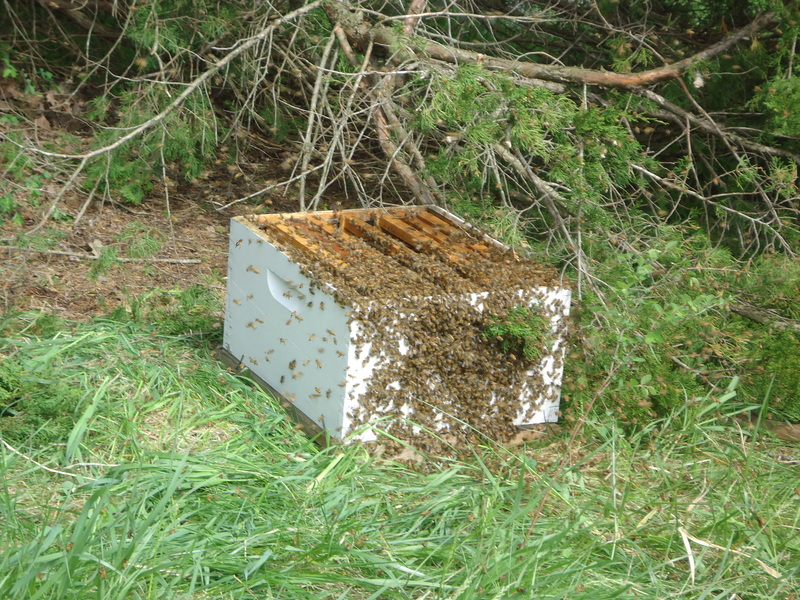 We left the feeder as is for now but looked through the stack of empty boxes at the edge of the beeyard and swapped out the damaged frames before the bees start building new comb in between the frames, which would make it difficult to remove frames without tearing up the comb. If it’s not already too late, we need to order a couple queens so we can split one hive and requeen the more aggressive hive on the left (so we end up with four hives total). It is interesting how each hive has its own personality, with all the bees in one hive descended from a single queen. Some of the hives are easy to work with, while others are nasty brutes protecting their hive at all cost against robber beekepers like us. Last year the hive on the far left was one of those that we would always save for last and then work as quickly as possible, doing the bare minimum maintenance needed, and then getting out. Most of the stings I have gotten over the years have been from not paying attention (for example, putting my hand directly on a bee while moving boxes, panicking when a bee got stuck in my hair), but with this particular hive, some days it didn’t matter how much attention we paid. Sometimes just standing near the hive was enough to set them off. Usually they would give at least some warning (loud buzzing, aggressive body slamming), but sometimes they would sting any unexposed skin as soon as you approached the hive, before you even began to open it up. One day, before I realized what was happening, three bees had stung my hand one right after the other, like little kamikaze fighters. I had not yet even thought of putting my hands in their hive. Naturally, the most aggressive hives are sometimes the best honey producers, so it’s a tradeoff. At any rate, we want to requeen this hive, if possible. A queen will live about five or six years, but we generally try to requeen more often than that. Unfortunately for us, the hives don’t always accept the new queen we have picked out and will kill her and then raise their own. Then instead of getting baby bees emerging from eggs laid by the beautiful new queen we have selected for her gentleness and mite resistance and other positive qualities, we get yet another generation of dark angry bees descended from the old rogue queen, with all her unsavory characteristics. Every spring I enter the delusional state in which I firmly believe that this year, for sure, I will be able to keep ahead of all the weeds and effectively deter every deer, groundhog, squirrel, rabbit, mole, and bird from eating my plants; and for once, I will have a picture-perfect garden with no bugs, no yellowed or splotched leaves, every plant spaced properly and in its prescribed bed, manicured walkways between the beds, a well-designed and restful place where I can retreat to a garden bench or arbor and read among the fragrant herbs and colorful flowers and delectable fruits and vegetables. But alas, as I survey the reality of my yard and compare it to the carefully managed gardens that fire my imagination, I realize that once again I failed to rake all the leaves before winter set in or deadhead the vigorous self-seeding asters and coneflowers and blackeyed Susans, or cut back the dried stalks of anything, and now the perennials are back in force, already pushing their way up out of the earth, crowding other plants, leaping boundaries, growing through cracks in the sidewalk, and I can tell that unless I can somehow hire a team of landscape artists and strong-backed gardeners, I am destined to end up once again with the same wild, exuberant, untamed, free-for-all that I call my garden. But to keep up the fantasy for at least a little while, I have decided to inventory all the plants that are coming up in my front yard right now and make a list of tasks I need to take care of sooner rather than later–before the weeds take over and it gets too hot, before my enthusiasm flags. My dream is that someday I can learn everything there is to know about each plant I grow and that I can have something blooming at all times throughout the growing season. At the moment, the crocus have just burst onto the scene. 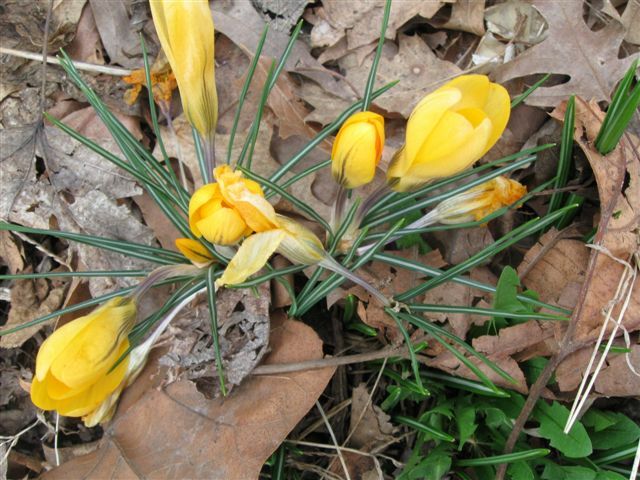 They appeared miraculously this week after we were surprised by a snowstorm on Monday and then surprised again after the snow melted to find a dozen bright yellow and purple crocus peeking out of the grass and dead leaves. The daffodils won’t be far behind. There are about twenty clumps of naturalized daffodils spread across the yard—several up near the street in the space I like to think of as the herb garden, more clumps in what was originally intended to be a “butterfly garden,” several tucked under the climbing rose in the corner at the end of the porch, a few clumps under the old lilac bush we cut down last fall, some by the mailbox, and others just wherever. The long pointed leaves are from three to seven inches high, depending, I suppose, on the variety or the amount of sun they get or possibly how old they are. I’m not really sure, and I no longer remember what kinds I planted or when I planted them. 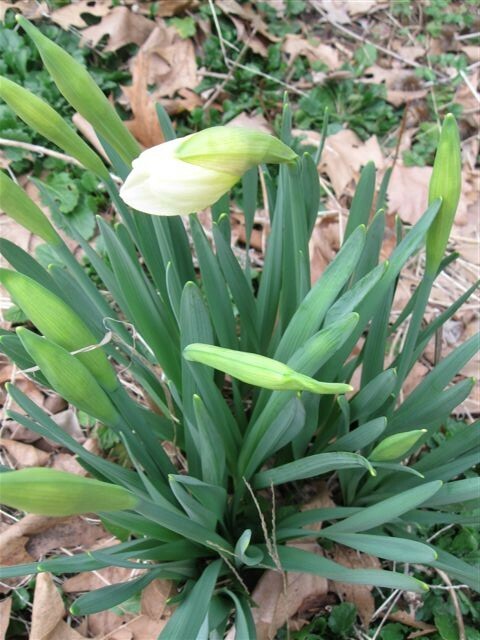 The bulbs are swelling and turning a pale yellow-green. I swear if I sat outside and watched for a few hours, I could actually see the blooms unfold in the sun. While the daffodils are blooming, the hyacinths will make their appearance, but I wish I had planted more purple than pink ones, because the purple looks better with the yellow daffodils. I originally chose pink because it was my grandmother’s favorite color, but I had no idea that the original five bulbs I planted would take off like they did. I also noticed one small remaining clump of tulips, which I need to spray with some sort of repellant (garlic or pepper spray) before the deer eat them to the nub; while tramping through my garden, the deer will probably also take a bite out of several of the hyacinths before they remember they don’t particularly like those. The daffodils they leave alone. Although I like the way the daffodils have naturalized, I’m not so crazy about the way the other plants have spread themselves across my yard, and each spring I think I should exert more control and actually attempt to design the beds rather than just let everything grow where it lies, but that is easier said than done. I suppose I’m what you might call a permissive gardener, thinking all plants have their merits, and I hate pulling out perfectly good, healthy ones. I tend to think, “Who am I to decide what grows and what dies?” (Does that make me a bleeding heart? I suppose. I don’t like squishing bugs, either.) I also tend to plant things on top of each other, bulbs and perennials that will bloom at different times in the same space, and I forget what I planted where, so I hesitate to pull out unidentified plants, thinking they might actually be something worth having. Of course, by the time I realize, “Oh no! It’s a horrible weed!” it has completely gone to seed and has propagated itself all over the neighborhood. I really like the idea of “pocket gardens” and think that this year, instead of trying to redesign all the beds at once, I should focus on one small space at a time, no bigger than, say, four by six feet. My favorite spot in the whole garden (a small space where the sidewalks meet) was a complete accident. This particular pocket garden contains only three plants and takes up less than nine square feet, but it makes me smile every spring whenever the bright yellow alyssum, the purple geranium, and the deep red tulips all bloom at the same time. Here are the other plants that are already sending up shoots in my garden in mid-Missouri and soon will take over the yard. If we started at the front door and looped left through the yard, this is roughly what you would see. About seven clumps of “surprise lilies” or “naked ladies” lined up in front of the evergreens by the porch, where the iris used to be, plus two small clumps out by the street not too far from the mailbox. They are about 6” tall and could almost be mistaken for daffodils at this time, except the leaves are somewhat thicker and more rounded on the ends. The pale pink lilies will not actually bloom until late summer, after the leaves have died back and the stalks emerge “naked” from the ground, surprising me every time. By then, the ones near the street will be completely hidden by the asters that will soon fill that space and grow taller than the lilies. The iris appear to have “migrated” away from their original space in front of the evergreens and are now in a squarish patch closer to the sidewalk. The leaves are an inch tall at the moment. Another patch of iris is coming up under the old lilac bush (I don’t remember moving them). The new iris rhizomes that I bought at the farmers market and planted late last year near the street seem to be coming up as well. These are about 1/2” tall. I doubt they will bloom this year. I did write down which kinds I bought, but I didn’t pay attention to which rhizome I planted where. Maybe I can match them up later, after they bloom. Sure, why not? The strawberry plants along the sidewalk are looking good, with dark green leaves about 1” in diameter, but some of the plants are being crowded out by the blackeyed Susans and asters. I need to start thinking now about how to keep the birds and squirrels out of the strawberries. I kind of wish I had gotten one of those tiered strawberry planters and set that in the middle of the garden, rather than plant the patch along one side of the sidewalk. It seems too asymmetrical, even for me , but I can’t plant strawberries on the other side of the sidewalk because I have been growing tomatoes over there, and those plants share diseases. I can’t tell if the lavender survived the winter. The dogwood tree that Jim rescued several years ago from the corner by the chimney, where it had grown from the seed of our neighbor’s tree, has fat round buds. There are deer prints in the corner off the end of the porch beneath the climbing rose. The rose itself is sending up wild shoots over the fence toward the neighbor’s yard. A small clump of daffodils is nearby. There are two clumps of poppies with leaves about 3” long coming up in the old “butterfly garden.” Seems like there should be more of these, but perhaps they are hidden under the leaves I need to rake. Black-eyed Susans are greening up, the leaves low to the ground, but they need serious thinning. Shasta daisies are still low to the ground but starting to green up, with leaves about 1” long; like the daffodils, these have naturalized and can be found in all the garden spaces, and I love the way they look on breezy sunny days in June (hundreds of cheery white petals with bright yellow centers, held up by delicate stems). The geraniums are greening up; leaves about 1 1/2” long. These have been most satisfactory. They bloom for a long time and they spread in a sensible way. I might want to think about planting more of these when I plan my pocket gardens. Poppy mallow has 1” leaves close to the ground. The fleshy hyacinth buds are appearing all along the front edge of the garden. The verbena by the street and in the new iris bed is getting green; the leaves are about 3/4” long. I like these low-spreading, long-flowering vines almost as much as the geranium. Lambs ear is everywhere. I love its gray fuzzy leaves and the odd little pink flowers that appear in late summer at the end of a long woolly stalk, but really, I have let it get out of hand. I am always surprised when people tell me they have had trouble growing it. The two sage plants have gotten quite woody but arestill strong and shapely. There are pale thin grass-like chives everywhere, in every garden and in the cracks between the sidewalks and stepping stones. Even though they look delicate, their roots are already tenacious and nearly impossible to pull out. Asters, cone flowers are all gone to seed; dried leaves everywhere. The butterfly bush needs to be cut way back. Although it is an invasive species here, it does attract the butterflies, and I enjoy it. Still, its placement isn’t ideal because it shades the vegetables I try to grow nearby. Chrysanthemums are barely visible beneath the dried leaves near the square-foot vegetable gardens; the leaves are about 1/2” long. Two square-foot gardens stand ready for planting. I just need to add some compost first. I will probably also add some organic fertilizer. I already raked out most of the acorns and leaves that had fallen into the squares over the winter. The broccoli seed I started indoors is ready to go in the ground any time. The white rose bush needs pruning and protection from the deer. A smaller lilac bush that we transplanted last year or the year before is looking good and will probably bloom this year. A single hollyhock with big bold leaves about 4” high. I wonder if I could get hollyhocks to grow along the side of the house where the chimney is. 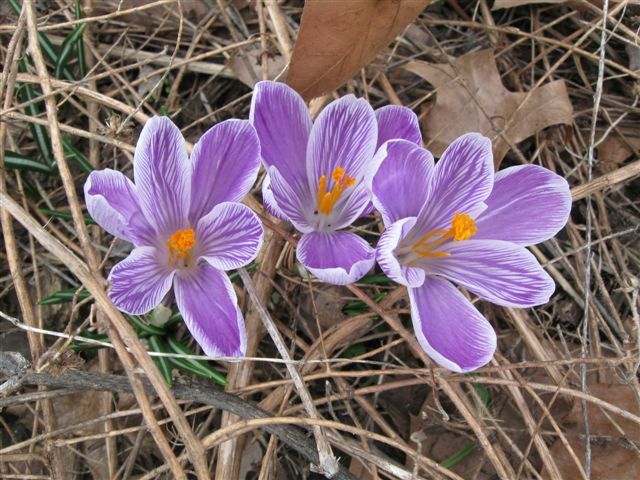 Crocus provide an early source of nectar and pollen for the bees.